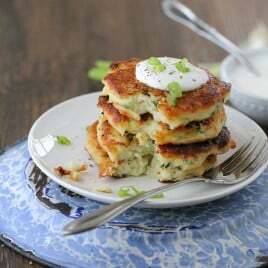 Mashed potato cakes are an easy way to use up leftover mashed potatoes or to add a new twist to your potato side dishes. So simple to do, you’ll be snacking on their golden crispy edges and tender middles before they hit the table. This post was originally published in March, 2015. There are a few recipes in this world that are highly reliant on good seasoning. Mashed potato cakes and salmon patties are two that I’m convinced can be wonderful or a total disaster based on what you put in them. When testing this recipe, I faced a few batches that were just awful. Bland. Boring. But we prevailed and I feel like I’ve created a version that while simple, still brings a flavor that you’ll love to any meal and is a great way to use up leftover mashed potatoes, or is special enough to warrant you making a batch just for this recipe. Make sure your potatoes are well seasoned from the get-go. I make my mashed potatoes with salt, butter and sour cream so I started with a base that had great flavor in the first place. If you don’t typically add sour cream to your mashed potatoes, toss in two tablespoons per cup of potatoes you’re using to make your potato cakes. Don’t hesitate to add more salt if needed to punch up the flavor. Always taste your potatoes before you fry them to know for sure what they need. I like green onion tops here for color, but if you would prefer, a good old grated yellow onion works just fine. Remember that grating them makes the flavor stronger, so a tablespoon of grated onion would be plenty per cup of mashed potatoes. Use a neutral oil like vegetable or refined coconut oil to fry yours and use a good pan (I like cast iron) for even heating and that perfect golden crust. Add in some grated cheddar cheese if you’d like, and top them with sour cream and even bacon for that “loaded” potato flavor. You can also check out an already loaded version as a base. Can mashed potato cakes be frozen? I think so, yes. Fry them then lay them in a single layer on a cookie sheet. Freeze, then transfer to a zip lock bag for freezing. To reheat, bake them from frozen on a cookie sheet or in a toaster oven. They may not crisp up like they were originally, but they will still taste great. 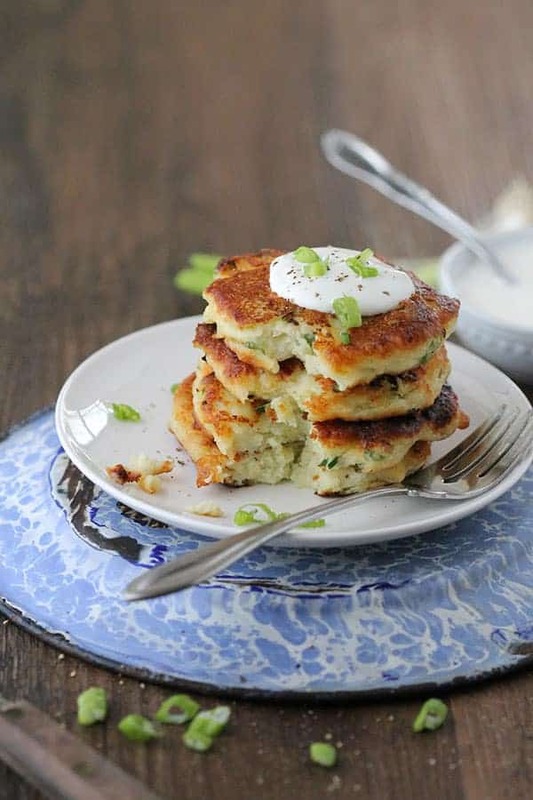 What can I serve with mashed potato cakes? I love southern classics like macaroni and cheese (we’re gluttons for carbs in the south), or alongside a rack of crispy baby back ribs. As a rule of thumb, it’s a good idea to pair a starch like potatoes with something green (beans, salad, brussels sprouts, etc) and a main protein. Use leftover mashed potatoes in this traditional country classic. Crispy potato cakes can be fried and rewarmed in the oven for your next meal. Mix the potatoes, onions, flour, egg, salt, pepper and milk in a medium bowl. The mixture should be thick enough to cling to a spoon but sag just a bit when you hold a spoonful up in the air. If it's too thin, add some more flour. Too stiff, add some more milk. Heat the oil over medium until it just starts to shimmer--about 3 to 5 minutes or so. Place heaping tablespoons of potatoes in the skillet and spread them with the back of your spoon. Cook until golden on each side--about 5 minutes per side. Serve warm or cool to room temperature and refrigerate for later. Add two tablespoons sour cream to each cup of mashed potatoes for a "loaded" taste and a richer flavor. Taste the potatoes for proper seasoning--this will vary depending on how well seasoned your potatoes were to start with. My grandma always made potato cakes when company stayed over during the holidays. I had not thought of them in ages but made some this evening and not 9nlu were they delicious but brought back wonderful memories! Thanks so much! My grandmother used to make these the next morning after holiday dinners. I don’t know why I never had her show me how to make them but I am so happy to have come across your recipe! THANK YOU for taking back in time at 52 and and being able to share and pass along a lost tradition. They were the perfect consistency, tasty and delicious. Perfect way to use leftovers! These look so good! Fluffy on the inside and crispy on the outside. YUM! Love that your old teacher did a feature on you. So fun! Yeah, it was a lot of fun. Thanks Liz! What a lovely surprise to be featured in your hometown paper! That’s so cool… and so fun to reconnect with so many folks from your past! These potato cakes look amazing. 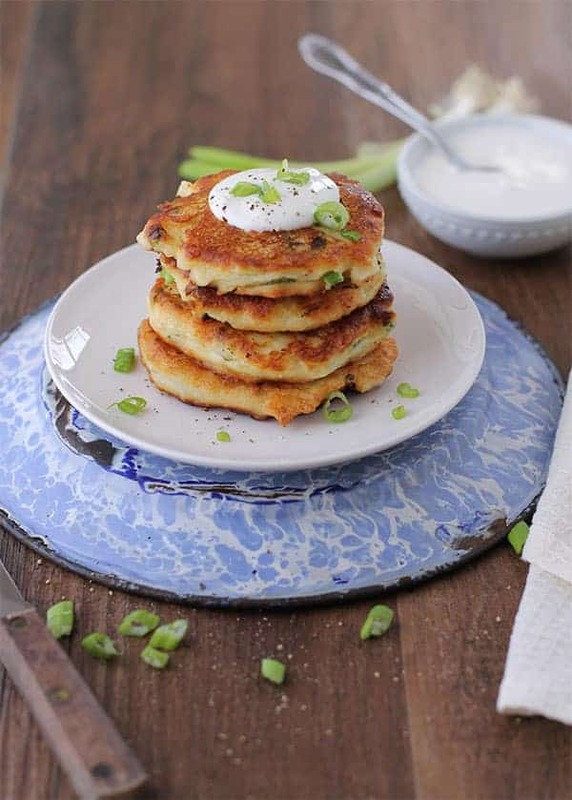 I love me a good potato cake, and these look like the perfect combination… and they don’t look too greasy, as some potato cakes are prone to be. (Just me? Or maybe I’ve just yet to find the right recipe… We’ll be trying yours next.) Thanks for sharing! I’ve never made potato cakes! This will be a wonderful way to use leftover potatoes! Thanks! Give them a try Katie and let me know what you think, okay?